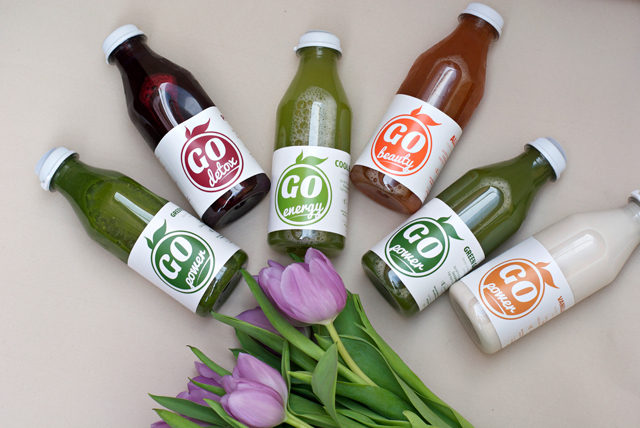 On the Go Gusto web page you can find all the information you need for a successful juice detox. As a preparation they advise you to refrain from several foods for two days, and even though eggs and fish are not listed, I decided to make two vegan preparation days. Living vegan wasn't as hard as I had guessed, I had almond milk porridge for breakfast, an Ebly salad and a quinoa stir-fry for lunch, and wholewheat bread with a pepper-nut spread for dinner. I got my juices on Friday but had decided to make the detox on Saturday as delivery time is between 8:00 am and 1:30 pm. As suggested I started my day off with a glass of warm water with the juice of a lime (as we had no lemons). 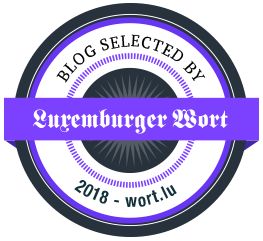 Unfortunately I felt really dizzy and queasy when I woke up, which may or may not have been due to my highly reduced calorie intake during the preparation days. Luckily enough I started feeling better after drinking the first juice and lots of water. 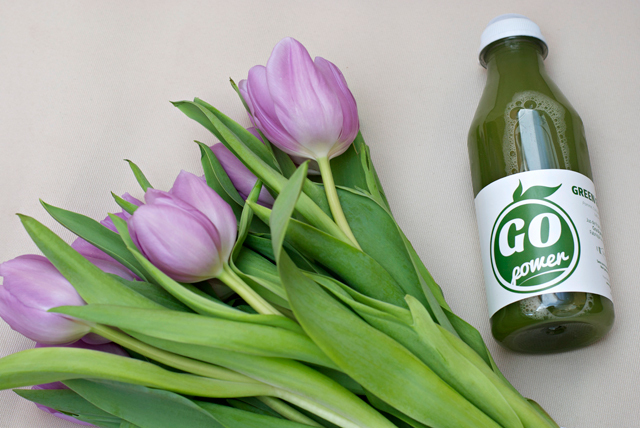 The first juice was the Go Power Green Essentials, primarily made of spinach, apple and salad. As a person who loves to eat something sweet in the morning (be it just the sweetness of fruit), I had a hard time drinking what tasted like liquid spinach on an empty stomach. I think it took me about 20 minutes to empty the 500ml. 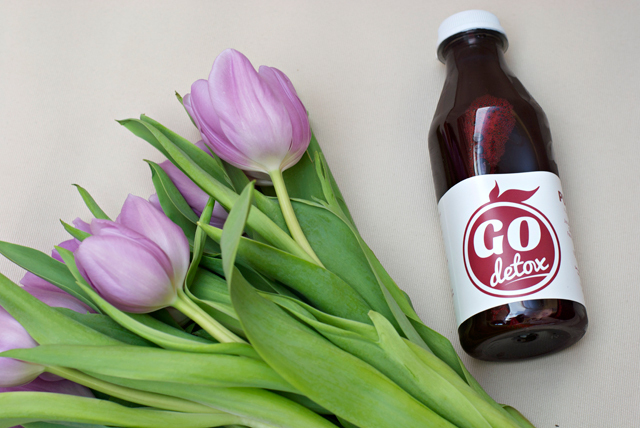 In the midmorning it was time for the Go Detox Pure Red, which consists of apple, beetroot and celery. Again nothing really yummy and I was glad when it was empty. Luckily enough I got some more tasty juices for lunch time. 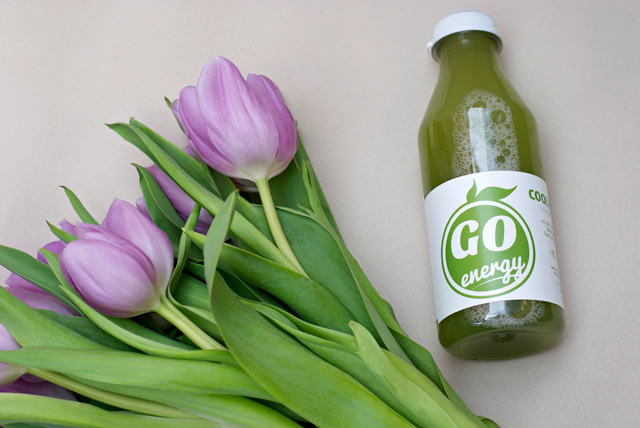 The Go Energy Cool Breeze is made of cucumber, pineapple and mint and thus tasted really fresh. Unfortunately it wasn't quite as filling as the two juices before, so I felt quite hungry around 4pm. 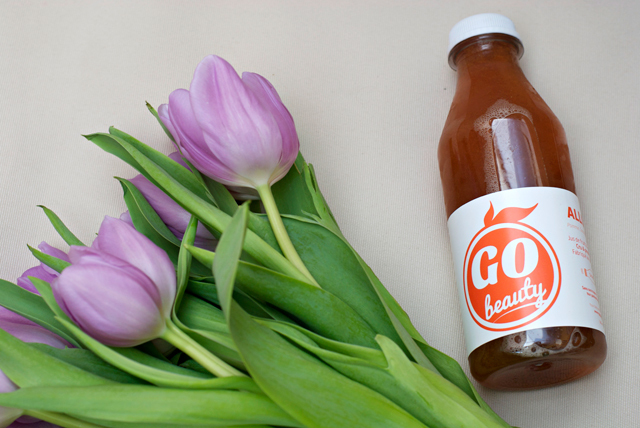 As a snack I got to drink the Go Beauty Allure, which contains apple, carrot and ginger, thus another quite delicious mix. In the evening I felt surprisingly sated so I wasn't necessarily craving for my next juice (especially as I thought it was with spinach, too). However the Go Power Green Garden is a mixture of apple, cucumber, cabbage, salad and lemon and was thus easy to drink. I still wasn't particularly hungry when I had my last juice around 10pm even though it was the one I had been looking forward most. 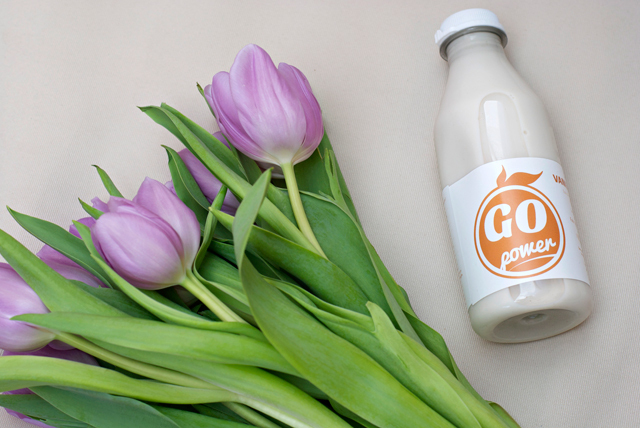 Unfortunately the Go Power Vanilla Dream only sounded good (almonds, vanilla, cinnamon and honey) but tasted really awfully (probably because it was so thin) and I didn't even manage to finish it. Even though most of the juices weren't as delicious as I had hoped them to be, I managed not to eat anything else that day and all my body got were the six Go Gusto juices, 3 litres of water and a peppermint tea. So at the end of the day I had consumed 1160 calories. Needless to say I'm really proud of myself as my weaker self is highly developed and I'm known as someone being hungry all. of. the. time. However I really just felt hungry in the afternoon and still managed not to accost my fellows. - Living vegan for a few days is easy and will help cut cravings. - Reducing your calorie intake the days before will ensure that you don't feel too hungry during your detox but you shouldn't go to bed on an empty stomach the day before the cleanse. 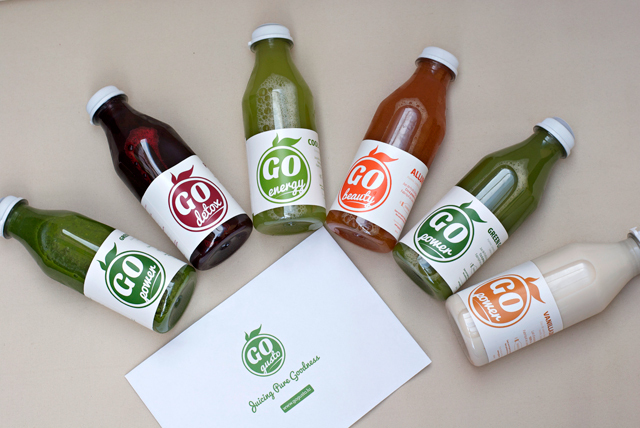 - If you order at Go Gusto, consider that your juices may only arrive around noon so it will be best to plan your detox for the other day. - Drinking lots of water really helps to prevent side effects like headache (the only side effect I felt, btw). 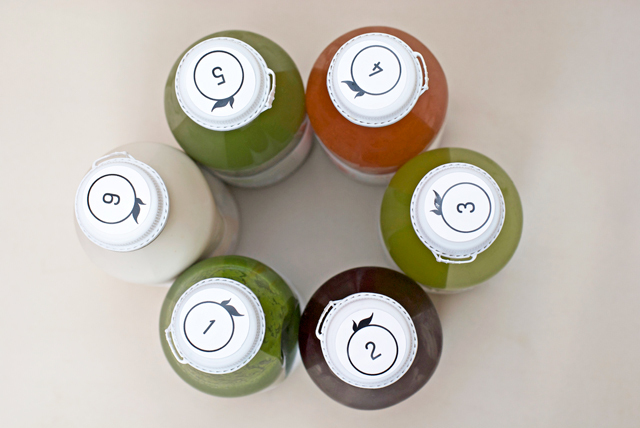 - You should mentally prepare to the fact that most of the juices will not taste delicious but maybe even rather gross. - If possible, stay at home during your detox. It has several benefits: 1. You know where to find the toilet, 2. You won't see and smell all the delicious food in the streets, 3. In case you feel dizzy you can just lay down and relax, 4. In case detoxing gets you in a bad mood, at least you don't rant at strangers. - Cleansing is a mental thing as well so rather consider it as a challenge than as an unnecessary torture. - Take care of what you eat the other day, especially for breakfast, as you stomach might easily be overcharged by solid food. Doing a detox is an interesting experience but I don't think I will do it again in the near future. I was really lucky not to feel any major side effects, nor be starving all of the time, but then again I didn't feel any major benefits either. During the three days (preparation and detox) I lost 0,9 kg but I know quite well that it's mostly water I lost and not fat. Also I wouldn't even be able to afford regular juice cleanses as the detox box by Go Gusto for example costs 50€ for just one day. Nevertheless the juices are all made fresh from only organic foods so one can be sure that they're only good for the body. Therefor I can only recommend to at least try them as a snack or breakfast. I wanted to do it as well, but I was a bit surprise by the cost of the one day detox - I suppose it is easier to prepare the smoothies by yourself if you are not particularly lazy. Moreover, I normally consume no more than 1,000 calories per day - so having a detox - even liquid - with 1,200 does not sound cool to me. Interesting share! I've been watching videos on youtube about people who do these cleanses for 3 days or even a week and I CANNOT IMAGINE DOING IT. I love eating food too much. Unless it's going to change or save my life so dramatically I can't imagine a full day of liquids. I salute you for trying it! That looks really great. I need to try. Now I feel really guilty about eating my sweet dessert in your presence! Interesting to read your review; personally, I prefer to pay attention to my daily food consumption and ensure that I make the best choices (the Saturday dessert doesn't count, haha) long-term, rather than go for radical detoxes whose effects are not going to last. Great news for us!! I need to try this!! !